Welcome Dear Readers to this week’s edition of Gregory’s Bible Stories. Today Gregory learned about Jesus and forgiveness. Let’s listen in as Gregory tells us all about it. One day Jesus was invited to have dinner at the house of Simon, the Pharisee. 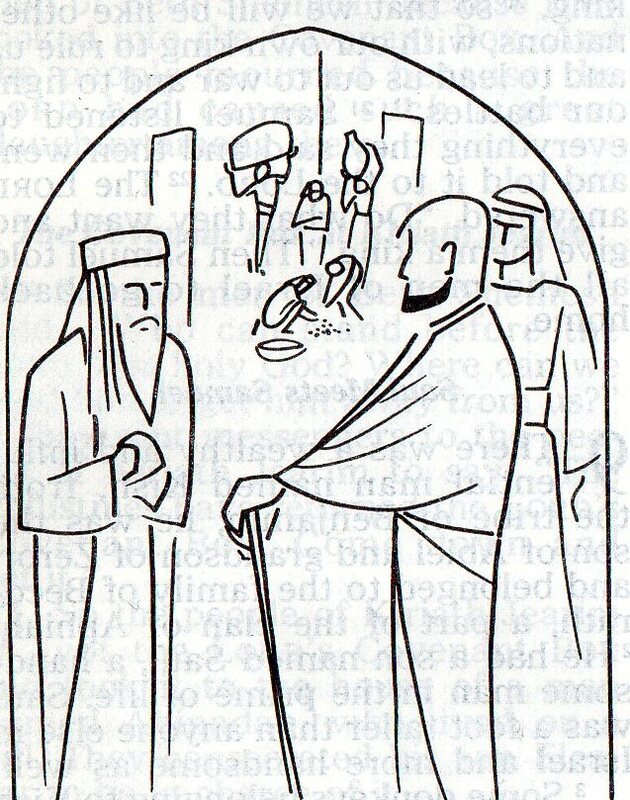 The Pharisees were a group of middle-class biblical businessmen who hung around the Chamber of Commerce every waking minute to make sure everyone followed all the rules correctly. Woman Who Leads a Sinful Life: It’s me. The woman who leads a sinful life. Simon: Can you narrow it down a little? WWLASL: I’m the woman who leads a sinful life and carries around an alabaster jar of perfume wherever I go? Simon: Hm. . . wait a minute . . . you’re not the woman who leads a sinful life who carries around an alabaster jar of perfume wherever she goes and has hundreds cats are you? WWLASL: No that’s my sister. She’s always borrowing my alabaster jar of perfume without asking. If you’ve ever noticed, it’s got scratches all over it. Anyway, I heard Jesus was eating dinner with you, and I was wondering if it would be okay if I came in and stood behind him and cried. Simon: Is that okay with you Jesus? Simon: Excuse me? Hey you! Woman Who Leads a Sinful Life! Your tears are getting Jesus’s Feet wet. WWLASL: Oh I’m so sorry! Gosh this is embarrassing. Do you have a towel–well never mind I’ll just use my beautiful, long hair. Jesus: There were two men who owed money to a moneylender. 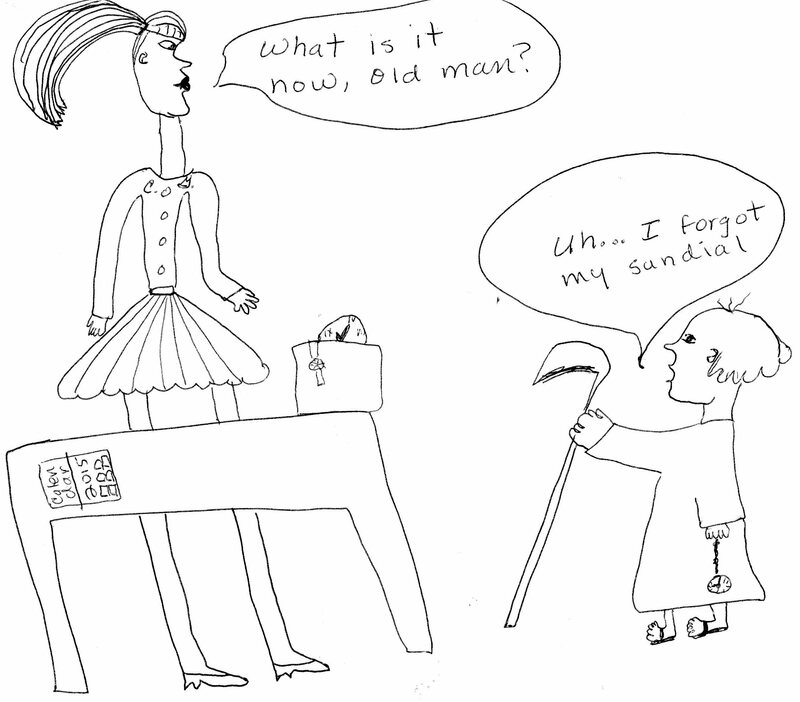 One owed him five hundred silver coins and the other one fifty. Simon: Oy! This isn’t going to be another arithmetic story problem is it? Jesus: No don’t worry. It’s a parable. Anyway, the moneylender canceled the debts. Which man would love him more? Simon: Uh . . . the one who was forgiven more? WWLASL: Is that your final answer? Simon: You stay out of this. 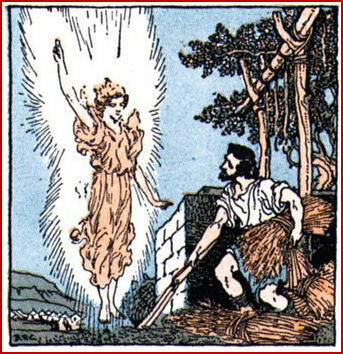 Jesus: Do you see this woman? I came into your home and you gave me no water for my feet, but she has washed my feet with her tears and dried them with her hair. You did not welcome me with a kiss but she has not stopped kissing my feet since I came. You provided no olive oil for my head but she has covered my feet with perfume. Simon: Am I correct in assuming, then, that my killer recipe for Simon The Pharisees Tuna Noodle Casserole Delight didn’t make up for all that? But if Jesus heard Simon’s question, there is no record of it in the bible. And there you have it, Dear Readers. Please check back next week at this same time to see what Gregory learns next in Sunday School. Welcome Dear Readers to this week’s edition of Gregory’s Bible Stories. Today Gregory learned about how God gave the Philistines tumors when they stole the Lord’s Covenant box. 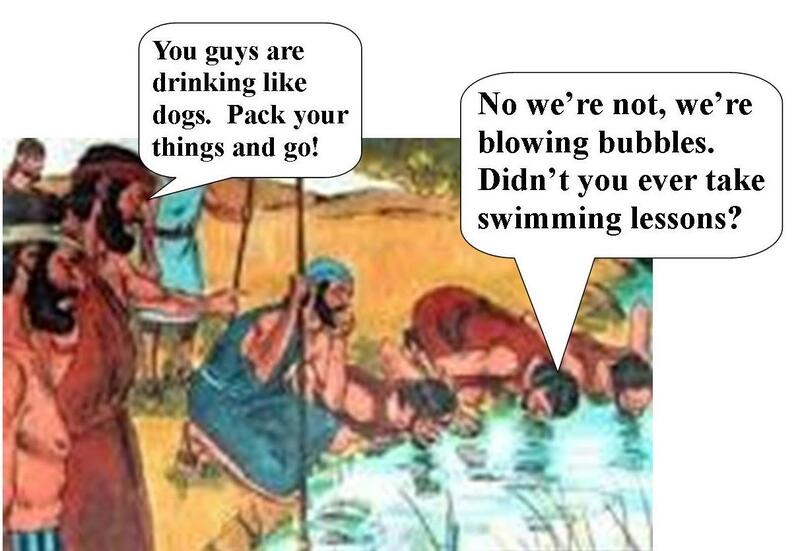 One day a group of untrustworthy Philistines (the Philistines were a group of smarmy biblical peoples all named Phil) were going to some yard sales over in the town of Ebenezer when they came across the Lord’s covenant box. One of the more gregarious Philistines kept the lady who was running the yard sale distracted by pretending to be interested in a souvenir rock from the Promised Land while two other Philistines ran off with the Lord’s covenant box. Phil: Oy! This covenant box is heavy. Let’s drop it off at the nearest temple. Phil: But the nearest temple’s a block away. Phil: No there’s one right behind you. See that sign? Phil: You mean the one that says Dagon’s Temple ‘n Dry Cleaners? Phil: Who’s Dagon? The God of Clean Clothes! Don’t you ever go to false idol sabbath school? Phil: Not if I can help it. 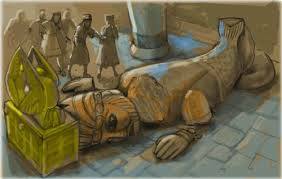 Phil and Phil set the Lord’s Covenant box next to the statue of Dagon which immediately toppled over causing both its arms and its head to break off. Phil: Now what do we do? Phil: I don’t know . . . say, do you feel lumpy? Phil: Come to think of it, yes. Uh oh. Are you thinking what I’m thinking? Phil: You mean that we both got hives from those figs we ate for lunch? Phil: No, that the God of Israel is punishing us for stealing His Covenant Box and putting it next to the statue of Dagon by giving us tumors all over our bodies. Phil: Then no, I wasn’t thinking what you were thinking. Phil: Say, we better get a message to all five kings of the Philistines, King Phil, King Phil, King Phil and King Phil. Phil: What about King Phil? Phil: Oh yeah, him too. I don’t know why I always forget him! After that, all five King Phils got together and did some official hub-bubbing on how to rid themselves of The Covenant Box and their tumors. They decided to try dumping the box off at the city of Gath. King Phil: So how’s it going in Gath? King Phil: Not so good. Everybody in Gath has bumps. King Phil: Maybe everybody in Gath needs a bath? King Phil: Always the comedian, aren’t you, Phil. Then the five King Phils decided to try leaving the Lord’s Covenant box in Ekron. King Phil: So how’s it going in Ekron? King Phil: Everybody’s got bumps. King Phil: Just bumps? No lumps? King Phil: Bumps and lumps. King Phil: Bumps and lumps? Hearing that makes me down in the dumps! King Phil: Phil. Stop. I begging you. Seven months later the priests and magicians were brought in to see if they could come up with a way to rid the Philistines of their tumors by getting rid of the Lord’s covenant box –which was turning out to be way more trouble than it was worth. King Phil: Good news! The priests and magicians say we can rid ourselves of our tumors if we put the Covenant Box on a wagon with another box next to it that contains five golden tumors and five golden mice and hitch it to a wagon pulled by two cows that will pull it to the town of Beth Shemesh while they moo all the way there. King Phil: Why didn’t we think of that? 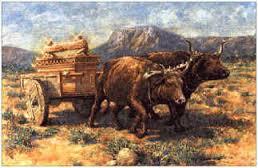 When the Covenant box got to Beth Shemesh, the people rejoiced by chopping up the wagon and the cows and by burning them as a sacrifice to the Lord and a good time was had by all — except for the seventy guys who the Lord killed for looking in the box — but it was still pretty fun anyway. And there you have it, Dear Readers, what Gregory learned in Sunday School today. Please check back next week to see what Gregory learns about next time. Welcome Dear Readers to this week’s edition of Gregory’s Bible Stories. Today Gregory learned about how God whittled down Gideon’s army from 22,000 to 300. Let’s listen in as Gregory fills us in on what must have happened. 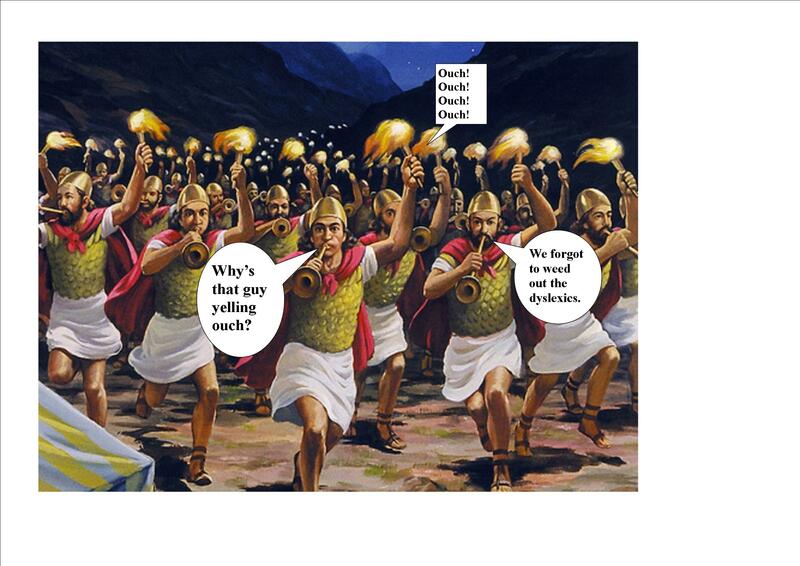 Gideon and five men of his men were fighting ten Midianites. Two of his men beheaded six Midianites and three of his men stabbed four Midianites seven times. How many heads of dead Midianites did Gideon’s wife have to find room for on their trophy shelf. Round up to the nearest Midianite. And there you have it Dear Readers. Please stop by next week at this same time to find out what Gregory learned in Sunday School.